It’s nearly that time of the year again! San Diego Comic-Con (SDCC) it wouldn’t be SDCC with a bombardment of exclusives leading up to the convention, right? The newly crowned DTA Toy of the Year Kill Kat by Andrew Bell will get a Radioactive FYE Exclusive edition! YEAH BOI GLOW IN THE DARK BABY. Have a break have a Kit Kat….. Wait……. 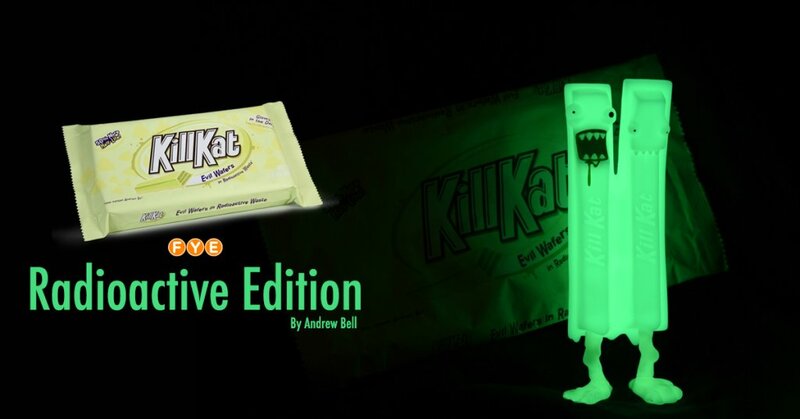 Andrew Bell’s Kill Kat’s invasion has spread and taken over the confectionery world! #FAKENEWS You might not want to take a bite outta them as they might give you the deadly bite! Last year saw the OG release of the Kill Kat and we couldn’t resist buying one ourselves. Now with this latest GID edition shown, its time to move our own display around and make space for Radioactive Kill Kat FYE exclusive. Are sugary treats killing us? Kill Kat is certainly trying! Andrew Bell’s original sculpture is back in a vinyl figure from Dead Zebra Inc and the O-No Food Company. This sweet and evil conjoined candy is dipped in Radioactive waste and Glows in the dark.. This is a collectible art sculpture, not a toy or a food product. Intended for adult collectors, not suitable for children under the age of 14. DO NOT EAT. Seriously!